With each passing day, more of the systems that provide us with food, water, shelter, energy, communication, and currency are digitized. Accordingly, cybersecurity and its advancement as a discipline has never been more important; it is now existential. Governments across the globe generally grasp this fact and also understand that it is the private sector owners and operators of these systems that are on the front lines of defense. As the saying goes, however, “a little knowledge is a dangerous thing.” In reaction, governments and their agencies have done what they typically do: they regulate. In the United States alone, the federal financial services regulatory agencies recently self-reported 43 separate and distinct cyber supervisory expectations (e.g., guidance, guidelines, supervisory requests and questionnaires, diagnostics and tools) applicable to the sector. Those 43 items did not include questionnaires, first-day letters, and other non-public supervisory expectations that financial institutions are also subject to during their examination process, nor does it include the cyber regulatory expectations issued by each of the fifty states. Assessed individually, most of these existing supervisory expectations could help advance the cybersecurity posture within firms, in that, for some firms, it helps focus both financial and personnel resources. The sheer volume and velocity of cyber supervisory expectations, however, has been counter-productive to cybersecurity. Firms have had to focus more of their cyber professionals’ time on compliance related activities, such as mapping their firms’ cyber programs to the various and differing categorization systems and terminology specific to each issuance, at the expense of sitting at the computer, protecting systems. When the sector surveyed its information security teams approximately two years ago, one multinational estimated that 40% of its cyber team’s time was spent on compliance related matters, not on cybersecurity. That multinational’s experience was not unique; it was the mean. Faced with the well documented shortage of cybersecurity professionals, it is not a percentage that has been meaningfully reduced. In fact, it is likely to increase if the 72% of FSB member jurisdictions that intend to release new cyber guidance continue to do so in a fragmented, non-harmonized, and non-standardized manner. The Pandora’s Box of fragmented cyber regulation can be closed, however. There is HOPE: there is an international solution. The solution is the Financial Services Sector Cybersecurity Profile, a meta framework based on the organizational structures of the National Institute of Standards and Technology “Framework for Improving Critical Infrastructure Cybersecurity” (NIST Framework) and CPMI-IOSCO “Guidance on cyber resilience for financial market structures” and extended with assessment questions based on the FFIEC Cybersecurity Assessment Tool and direct correlative mappings to the ISO 2700 series. Starting in October 2016, the financial services industry began mapping the various financial services regulatory organizations’ supervisory expectations against the NIST Cybersecurity Framework, CPMI-IOSCO and the ISO standards. With multiple mappings complete, a pattern emerged: over 80% of the mappings were topically identical, but semantically different. To reduce the time for reconciling these differences, the industry began developing the Financial Services Sector Cybersecurity Profile. 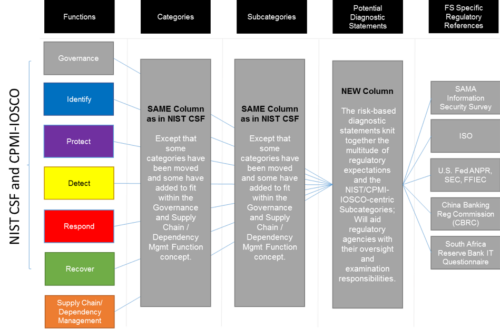 The Profile was architected around the NIST Cybersecurity Framework’s five functions, categories, and subcategories, and extended to include two new functions – Governance and Supply/Dependency Management – which emerged as distinct areas of (appropriate) regulatory focus. ). Borrowing from the FFIEC Cybersecurity Assessment Tool, the Profile also added a series of Diagnostic Statements that synthesize overlapping expectations from multiple regulatory organizations into a more singular, standardized set of assessment-ready diagnostics. As firms move numerically lower on the Impact Tiering levels – from 4 to 3, 3 to 2, and 2 to 1 – they would answer progressively more diagnostic statements to account for their increased criticality. This work is near complete, and the sector anticipates releasing a fully developed Sector Profile Version 1.0 in the September. The Cybersecurity Profile provides a mechanism for alignment of, and acknowledges, to align current regulatory expectations, requirements, and authorities. More importantly, it provides a clear path forward to streamline existing and any future cybersecurity regulatory expectations around a common structure and vocabulary. As noted below, the benefits are innumerate, as agreeing on a standard architecture would not only benefit the regulatory community and financial institutions, but the global society dependent on the security of the financial systems that enable the activities of their daily lives. Greater intra-sector, cross-sector and international cybersecurity collaboration and understanding. The 25 member jurisdictions of the Financial Stability Board are: Argentina, Australia, Brazil, Canada, China, France, Germany, Hong Kong, India, Indonesia, Italy, Japan, Korea, Mexico, Netherlands, Russia, Saudi Arabia, Singapore, South Africa, Spain, Switzerland, Turkey, United Kingdom, United States and the European Union.